I feel like it’s been raining for three weeks straight. Oh wait, it HAS been raining for three weeks straight. Over the last two and a half weeks, there were TWO sunny days without any rain. Amazingly enough, hubby happened to have the same two days off work so we made it into a little vacation. We went to Orlando for little man’s end of school year trip. He got to school our activities since he did so well at school this year and, lucky for him, the baby doesn’t have many opinions on where we go yet). We visited the Orlando Science Center and SeaWorld. The science center was an awesome and fun place. I wish we didn’t have to live so far. There are 4 floors of exhibits, all exhibits are hands on, and there is a huge play area. Little man was in heaven until he was so tired, he begged to go to hotel to relax. As much fun as he had at the science museum, SeaWorld was definitely the star of the trip. 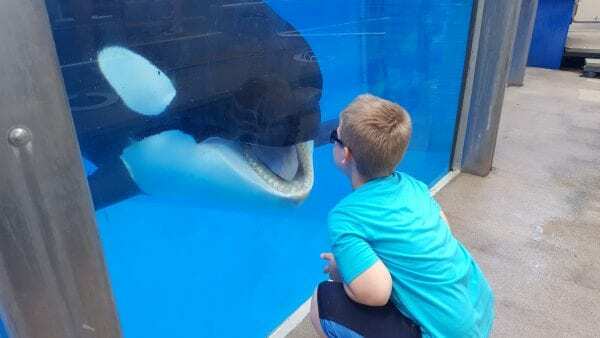 He really wanted to meet the Orca whale because he learned so much about whales this year. It’s all he talked about for a month and could hardly wait for our afternoon tour. He managed to pass time with roller coasters and shows though. We had a blast watching the animals, going on rides, and “playing” with the killer whale named Trula. Even though we specifically tried to avoid the heat and the crowd of the summer, it was scorching. I guess we can count May as one of the summer months already. We must have drank a gallon of water reach that day and ended our day with a nice big ice cream treat. Water and ice cream, that’s how you survive summer fun outside. Unless it’s raining, and raining, and raining. I’m getting excited to take kiddos to the beach for the first time this year and the rain keeps getting in our way. I miss our beach and milkshakes days from last year. Little man and I had a little tradition to have milkshakes after spending the day at the beach. 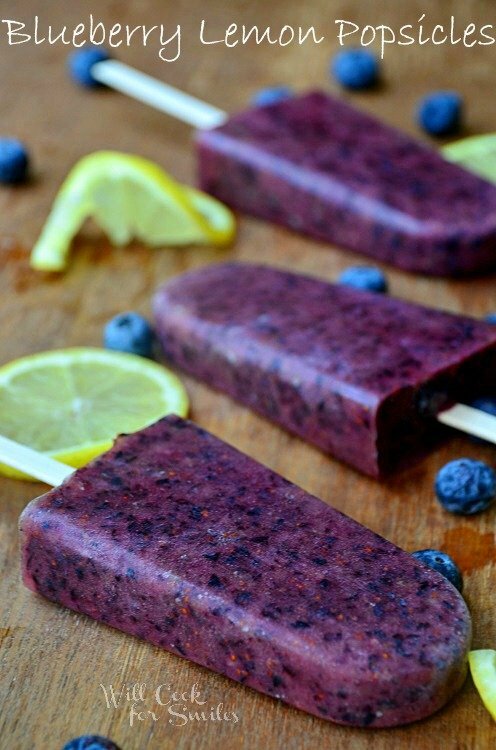 Frozen treats are quite satisfying to cool down after the beach. I have a special new recipe for him too. My son loves berries. 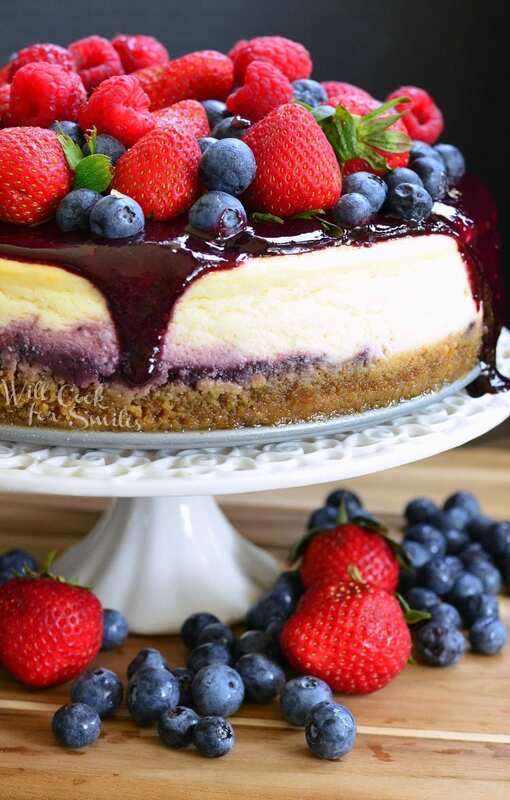 He eats blueberries with his breakfast almost every morning and a mix of berries and honey is his idea of a dessert. That’s why I always have blueberries, strawberries, and blackberries on hand. After seeing a commercial for new blizzards at DQ, I knew that the summer berry cheesecake milkshake will be the perfect treat for little man. 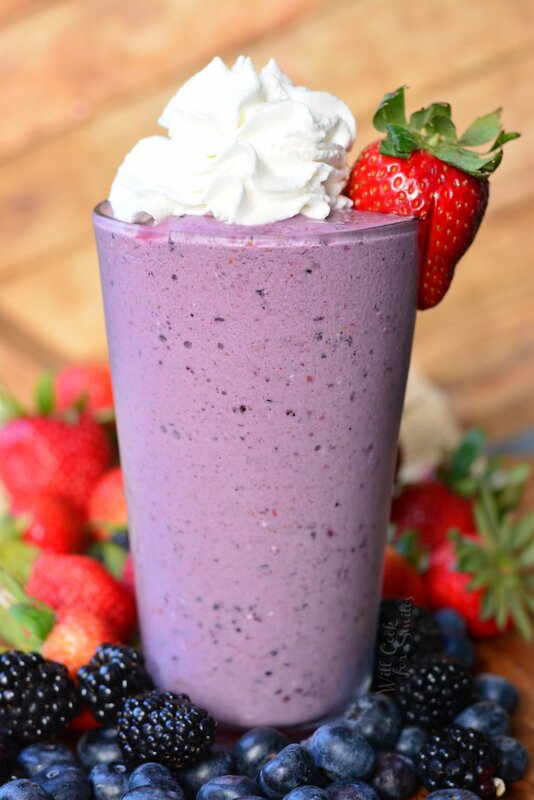 A milkshake that is packed with fresh berries, ice cream, and a touch of cream cheese is a summer-perfect treat. 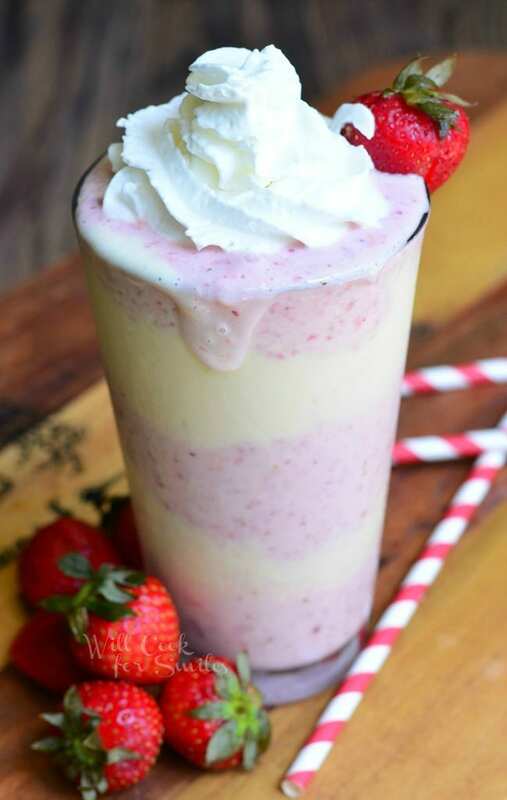 I can’t wait to make these milkshakes again after we get home from our first beach trip this year. 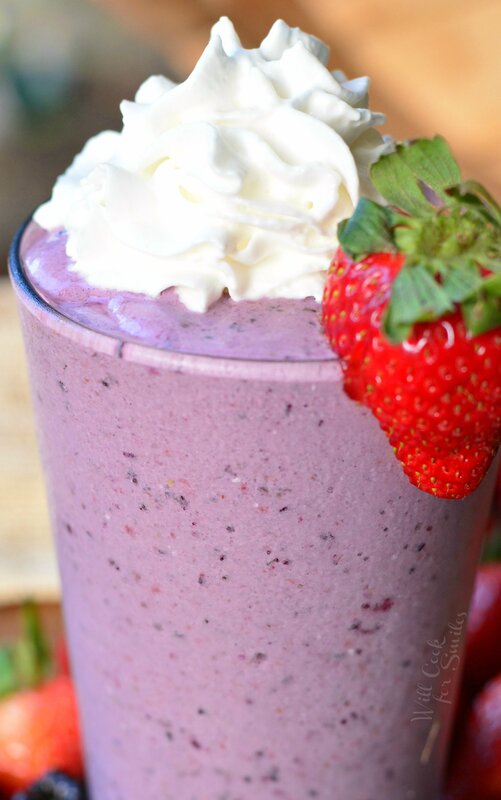 There are a few easy ways that I make my milkshakes lighter without compromising the yumminess taste. Number one substitution is of course, milk. 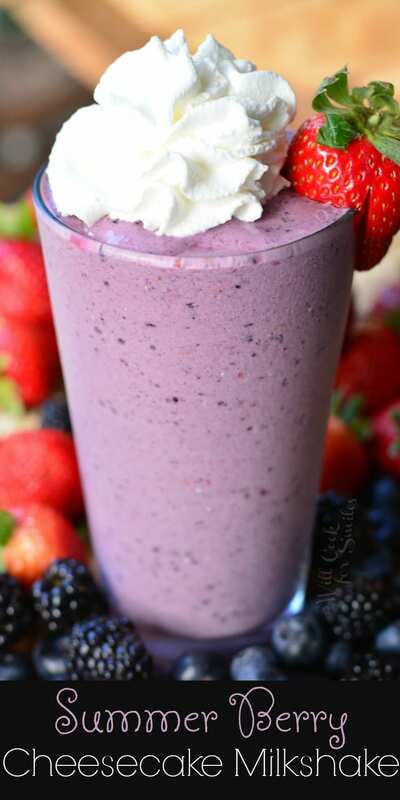 Substitute skim milk for a much lower fat content. 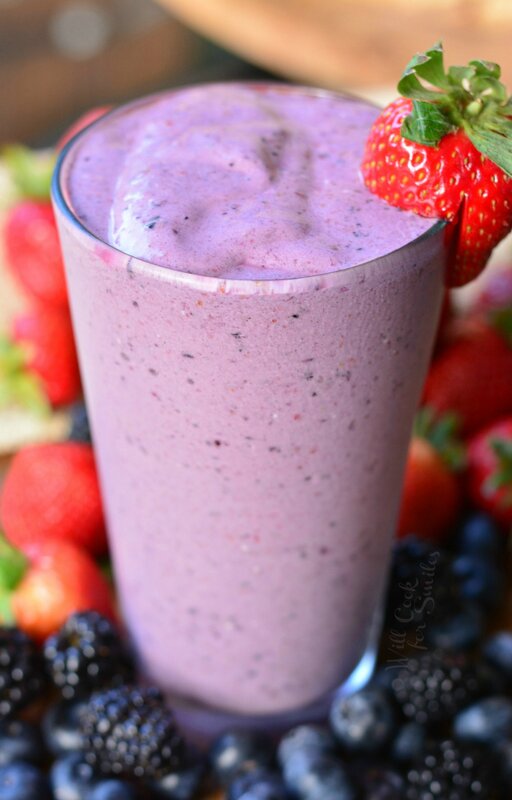 Using frozen yogurt instead of ice cream is the next substitution that will make your milkshake waistline friendly. 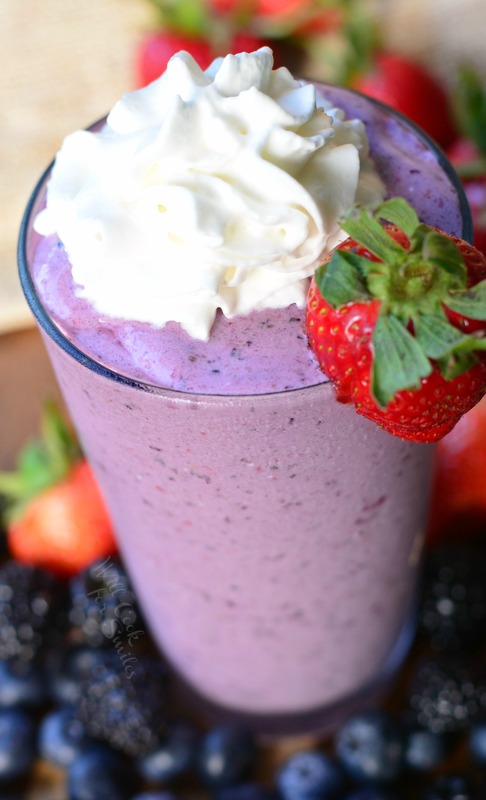 I use a classic vanilla frozen yogurt but other flavors can be used for different milkshakes. 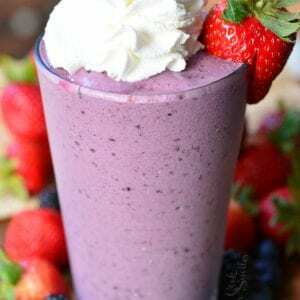 I this Summer Berry Cheesecake Milkshake, I use cream cheese. You may use light or 1/3 fat cream cheese instead of regular cream cheese to lighter the fat and calorie count. 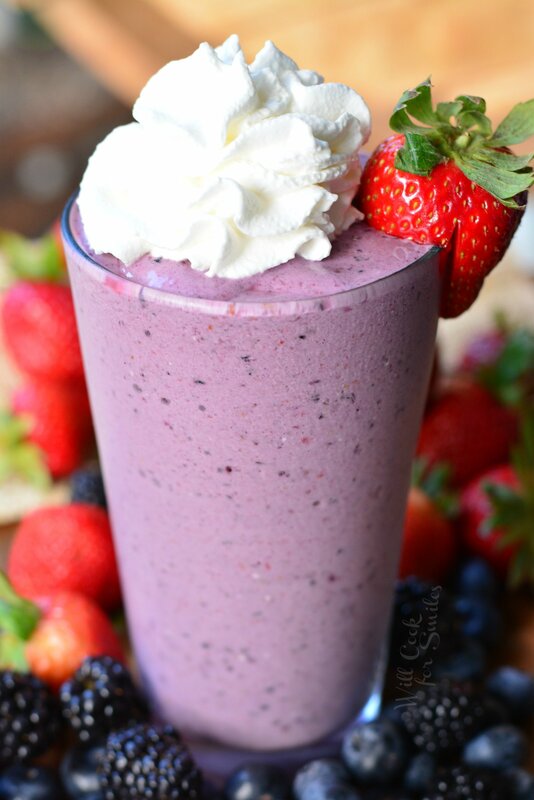 I never add any sugar to the milkshake, berries have enough sweetness and so does the ice cream/frozen yogurt. There is no need for additional sugar. Cut the stems off strawberries. Wash and dry all berries. 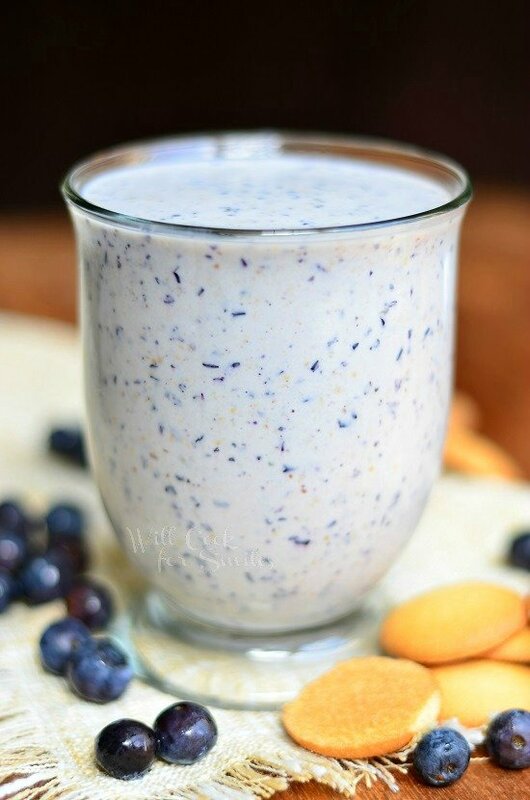 Combine all ingredients in the blender and pulse until all mixed and smooth. Decorate with whipped cream if you wish.